Objective: To identify and resolve discrepancies in admission medication histories, utilizing community pharmacy dispensing data, in newly hospitalized patients and investigate the relationship between unresolved discrepancies and length of hospital stay. Methods: Eligible patients (2 or more chronic conditions, 3 or more chronic medications and aged over 50 years) were randomized to the intervention or control group. Within 24 h of admission, the patient's nominated community pharmacy was contacted, a 6-month dispensing history obtained, patient was interviewed and a current medication list compiled. This was compared with the hospital drug chart. Discrepancies for the intervention group were discussed with the attending doctor. Subsequent resolution of discrepancies was assessed for all patients. Results: 487 patients were included (203 intervention, 284 control). Approximately 66% of all patients had at least one discrepancy between their reconciled list of medications and their initial drug chart, with no significant difference between the groups. Significantly more intervention patients had at least 1 discrepancy resolved in the first 48 h than control patients (intervention 78.1%; control 36.5%; p < 0.0001). A weak correlation was found between the number of discrepancies not acted on and length of hospital stay (Spearman Rho = 0.1, n = 487, p < 0.01). Conclusion: Errors in admission medication histories are common and potentially lead to an increased length of stay. 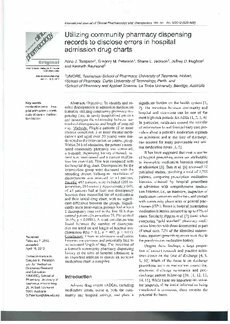 The provision of a 6-month community pharmacy dispensing history at the time of hospital admission is an important addition to ensure an accurate medication chart is compiled.